The Westin Buckhead Atlanta is a modern, newly refreshed retreat in an upscale community. Guests can indulge in world-class shopping at the adjacent Lenox Mall, the Shops Around Lenox, and Phipps Plaza, or access myriad dining options within minutes.The hotel has recently revitalized its public spaces and the renowned Atlanta restaurant, The Palm Restaurant and Bar. With more than 30,000 square feet of flexible function space, we can provide an inspiring setting for meetings, events, and weddings.Airy, bright, and fresh with sweeping skyline views, our 365 renovated guest rooms include our world-renowned Heavenly Bed and Heavenly Bath. Enjoy an in-room movie on a 32-inch LCD TV, or stay productive with wireless High Speed Internet Access. 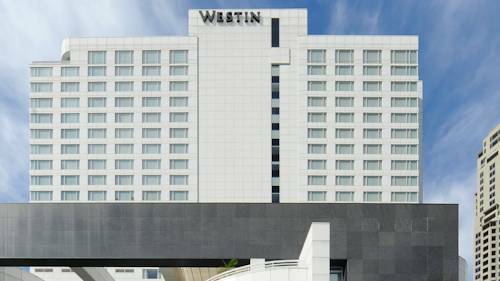 The Westin Buckhead Atlanta is situated in the heart of the action, on Peachtree Road amid world-class shopping and dining destinations.Those seeking a little retail therapy need look no further than adjacent, high-end shopping venues such as Lenox Mall and Phipps Plaza. Families hoping to keep the kids entertained can reach LEGOLAND, the Georgia Aquarium the worlds largest aquarium and the new World of Coca-Cola within minutes.Brimming with history and culture, the area boasts countless attractions such as the Margaret Mitchell House, Martin Luther Kings birthplace, the High Museum of Art, and Atlantic Station. Of course, Buckheads rolling hills and tree-lined streets make the neighborhood ideal for a leisurely stroll or an invigorating run. Fresh from a major revitalization, The Palm reflects Atlanta s sophistication while retaining a warm, inviting ambience. Guests are welcomed throughout the day at our classic American steakhouse and the new expansive bar that opens out to the lobby.